The passwords can also be used in the browser via browser add-on. It is possible to search for passwords via add-on. The user can search for passwords in the add-on, transfer them to the clipboard or automatically enter them in the input mask of the website. The automatic login may require applications. 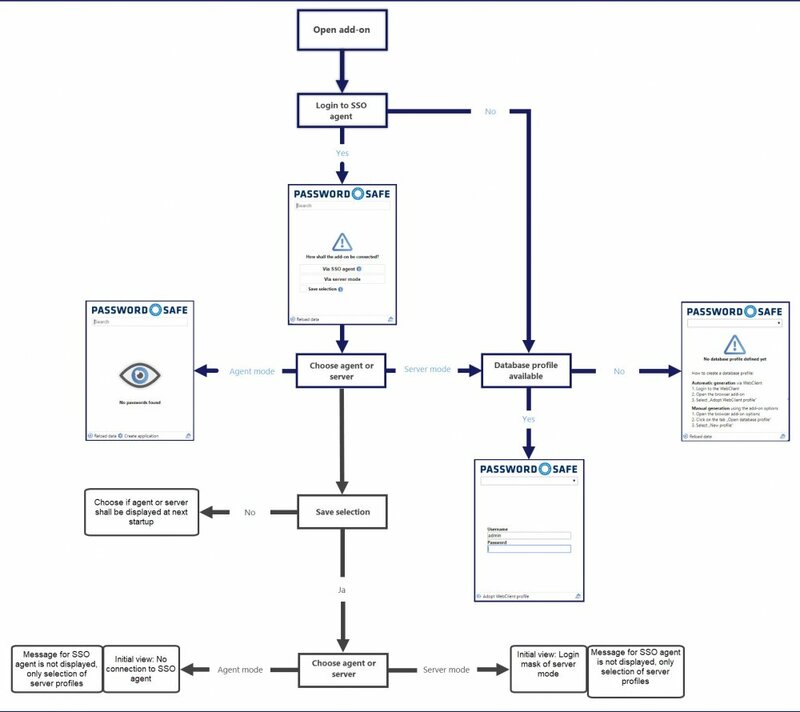 In order to provide the data, the add-on needs a connection to the database. This can be set up in two ways. Either via SSO Agent or directly in server mode. Currently, add-ons are available for the following browsers: Microsoft Internet Explorer, Microsoft Edge, Google Chrome and Mozilla Firefox. *We do not recommend using Internet Explorer in combination with Password Safe. As the technology of this browser is outdated, several functions can not be provided. For example, there is no server mode. No applications can be created either. The display of the icon is not dynamic. If the icon is displayed as shown, it means that although the add-on has been installed, a connection has not yet been established with the SSO agent. Only after logging into the agent (via the icon in the system tray) will you receive a Windows notification about the successful login. If a connection to the agent has been established, the number of available records for the current website will be directly displayed on the icon. After successful connection, the number of data records available for the current Internet page is displayed on the icon. The subscript “0” means that the add-on has a connection to the database. First, the database profile can be created manually. Therefore, he following information is required: IP address, WebClient URL and database name. Please note that /api is appended to the end of the IP address. It is also possible that the database profile is filled out automatically. For this, you need to log on to a database via WebClient. By clicking on the add-on in the WebClient, its profile can be taken over. Now all necessary information such as profile name, IP address, WebClient and database name are transferred. *The chapter WebClient describes how to transfer the database name and the user name into the URL of the WebClient. No terminal service is required in terminal server operation. SSO is no longer required. *Please note that SSO applications only work via SSO agent. 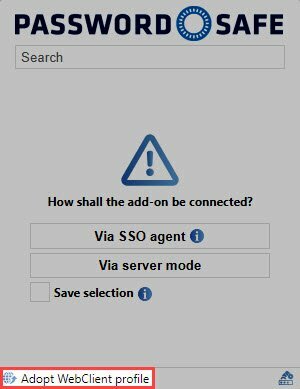 If you are in server mode and the SSO agent has not been started, SSO applications do not work! About browser add-ons: Automatically fill login masks ensures that access data is entered without the need for any confirmation when a website is recognised. The default browser option also has an impact on the add-ons. This setting defines the browser in which the websites are opened from the client. *It is important to note that the login mask for records with password masking will be ”sent automatically*, even if the setting Browser add-ons: Automatically send login masks has been deactivated. *A record can only be used for entering data if it has a form field of type “URL”. The subscript number mentioned in the previous section is only available with active logins and therefore already says a lot about the “Number of possible entries”. For example, if the number “2” is shown, you can directly select the account you want to log in with. Previously, the prerequisite was that you had to manually navigate to the precise website via the browser that you actually wanted to use. This navigation can now also be handled by Password Safe – as described in the following section. It is currently assumed that the user has to manually navigate to the website on which they want to automatically enter login data. This way of working is possible but is not convenient enough. The add-on can be used in a similar way to bookmarks. The search field can be used to search for the record in the database. The prerequisite is again that the record contains a URL. The screenshot shows that the URL and the name of the record (Wikipedia) are searched. The results for the search are displayed and can be selected using the arrow buttons or the mouse. The selected website will be opened in a separate tab. Which passwords are displayed for a recognised website depends on how the record or records have been configured. It is possible to define for each password how granular the URL should be checked. 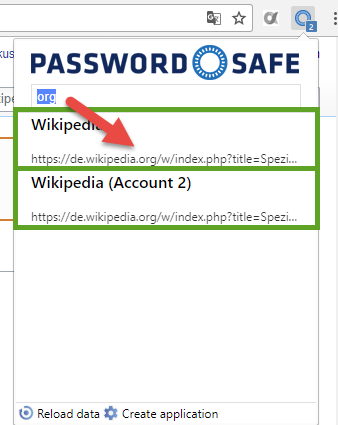 Further information can be found in the section “password settings”:https://help.passwordsafe.de/v8/1/en/topic/passworteinstellungen. The Exact domain check is activated for all passwords except for license.passwordsafe.de. 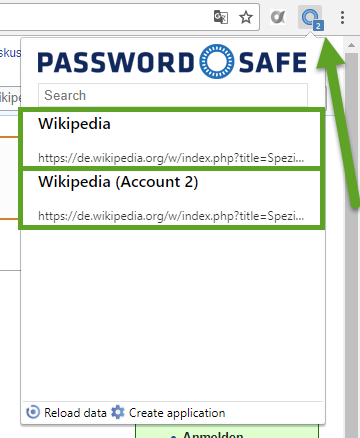 On www.passwordsafe.de, www.passwordsafe.de and license.passwordsafe.de are displayed in the addon. However, if the autofill function is only activated for one password but multiple passwords are possible, the password with the autofill function is entered. If the user clicks on a record in the pop-up, this record is entered as normal (as was the case previously).